At last! The search is over. The search for what, you ask? Why tooth decay, of course. There really is no excuse nowadays for a dentist not to be able to detect tooth decay as early as possible. As a first line of defense, dentists are accountable for finding signs and symptoms of decay before a cavity has the chance to officially taint your perfect set of teeth. At Chicago’s Sugar Fix Dental Loft, Dr. Jessica T. Emery uses the KaVo DIAGNOdent to diagnose tooth decay in its earliest stages. 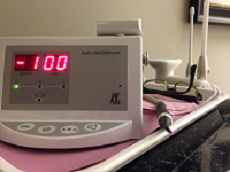 A tooth laser, if you will, the DIAGNOdent is a prime example of advanced dental technology. The laser device has the ability to find tooth decay by scanning a tooth and measuring that tooth’s amount of fluorescence. Stay with me here. Refresher: fluorescence is the visible or invisible radiation emitted by certain substances. Once Dr. Emery begins scanning the light probe over your teeth, a tone is emitted by the DIAGNOdent, which signals her to look at the screen and read the numeric value shown. The higher in pitch the audio signal, the higher the digital readout number, which in turn means the greater amount of decay. There will be two numbers that appear: The one on the left signifies the moment where a problem site is located and the number on the right signifies the peak. The higher the peak, the more decay within the tooth. A value of 25 and below means… Hooray! You have a healthy tooth. There was little to no fluorescence reflected and you are safe from decay. A value of 25 and above means decay is present and the cavity exhibiting fluorescence needs a dental filling or restoration, depending on the severity of the decay. Amazing isn’t it? To think we’ve come so far with modern technology that a handheld laser can discover hidden decay inside the tooth. These days, Dr. Emery doesn’t have to rely on the traditional dental explorer. You know what I’m talking about – that frightening metal instrument with the needlepoint tip. Not sure about you, but it scares the heck out of me! Did you know that the dental explorer can only detect tooth decay that is bigger than the explorer itself? That’s not so helpful when decay is buried deep inside the tooth. The laser light emitted from the DIAGNOdent penetrates about two millimeters into the tooth. We all want our smile to shine like the top of the Chrysler building. We all want our skin to slow and exude health and happiness. When we smile and show off shiny, straight teeth (and receive all those confidence-boosting compliments) we know we’re doing something right. However, when Dr. Emery uses the DIAGNOdent to scan teeth for possible decay, this is one instance where we don’t want our teeth to be strikingly bright, vivid and glowing. No fluorescence please! Call Sugar Fix Dental Loft today and make an appointment to have Dr. Emery and her team find any hidden tooth decay. By discovering decay in its earliest stages, Dr. Emery can save you from extensive and expensive treatment to remedy any cavities.